It’s getting to be summer around here in the Northern Hemisphere, and that means we will shortly be spending our days at historical reenactment events wishing desperately to be wearing something lighter than 10 lbs. of wool and linen. 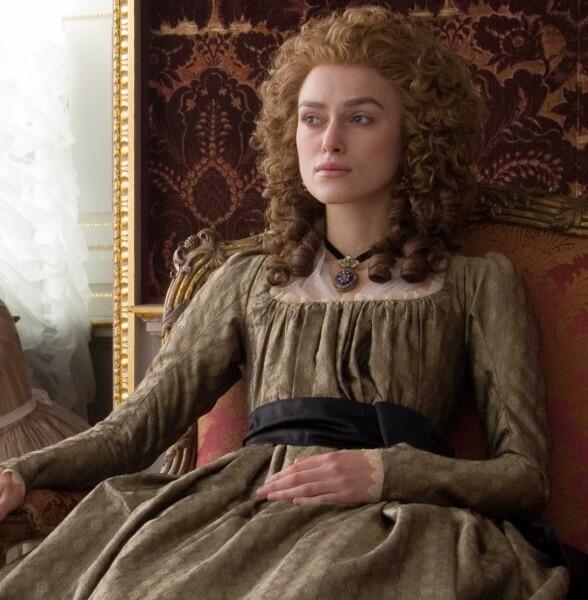 And what is lighter than the lightest dress worn in the 18th century, the chemise à la reine? So, as we say a tearful goodbye to pleasant, cool days in this part of California and say hello to hellaciously hot, miserable heat, let’s look at some of the famous chemise gowns that have graced the art of film. Thanks to Trystan for tipping me off to this one. There are some lovely chemise gowns in the 1933 Leslie Howard vehicle, Berkeley Square, co-starring Heather Angel and Valerie Taylor. 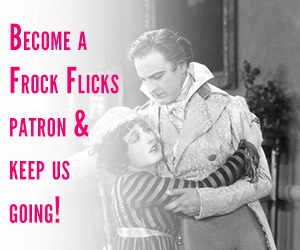 Lots of lovely Leslie Howard wearing fabulous 18th-century frock coats as well. Definitely worth a watch! 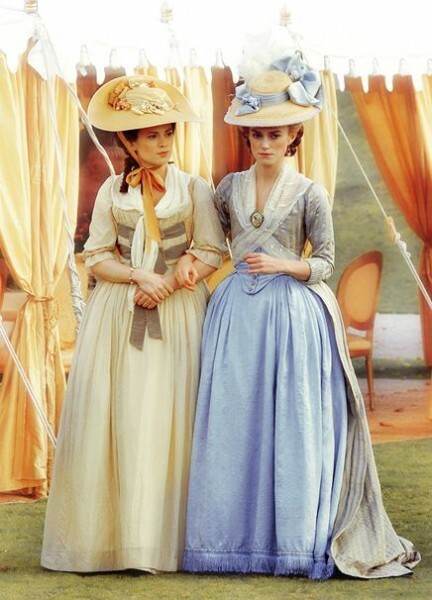 Costumes designed by William Lambert. This fluffy white striped cupcake of a dress is definitely a chemise gown. It’s just been put over panniers, and the neckline has been pulled way low over Norma Sheerer’s shoulders. Gowns by Adrian. 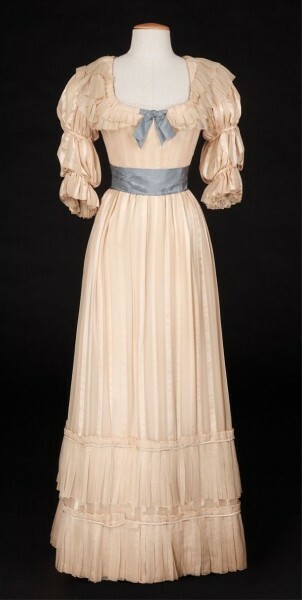 Thanks to Kendra for reminding me about this chemise gown. 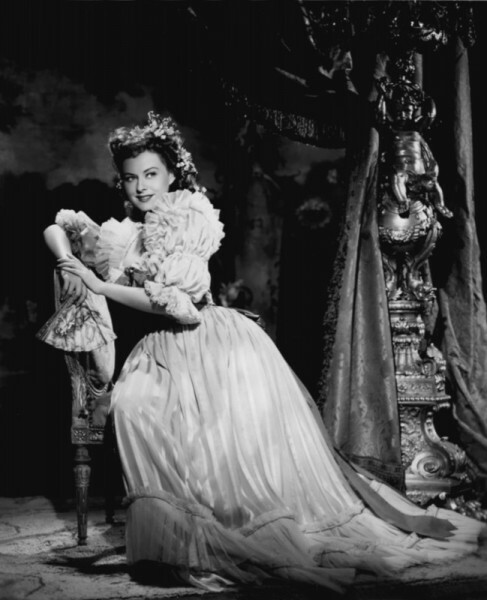 Paulette Goddard plays Kitty, a beautiful guttersnipe who gets cleaned up and poses for Gainsborough, and blah blah Pygmalion, drama, heartache, twooo luv. 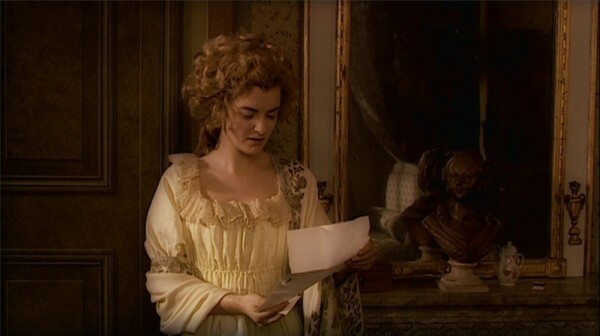 Anyway, her chemise gown is pretty fabulous, even if it lacks the gathered bodice (but it has no pointed waistline, so I’ll give it a pass). 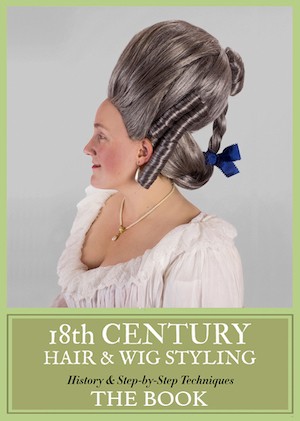 Kendra mentions that the photo of the costume is often misattributed as being an authentic 1780s gown on Pinterest. But trust me, you can count on three fingers the number of extant chemise gowns in the world and this is not one of them. 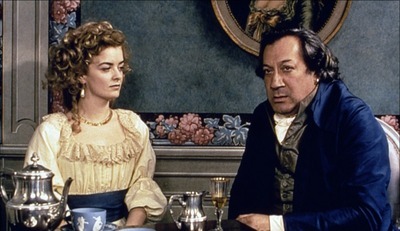 I will say that the movie nailed the era on the mark with the debut of the chemise gown in England, as the film begins in 1783. 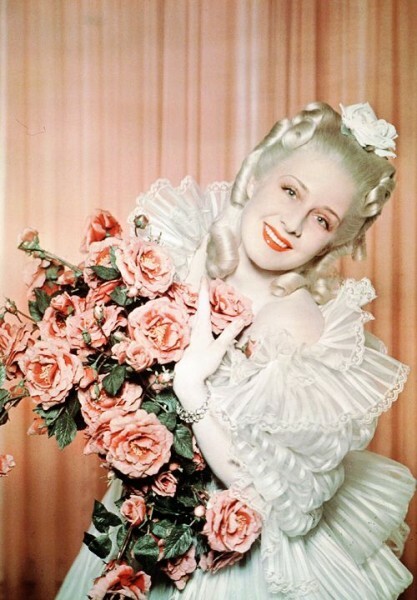 The costumes were designed by Raoul Pene Du Bois. 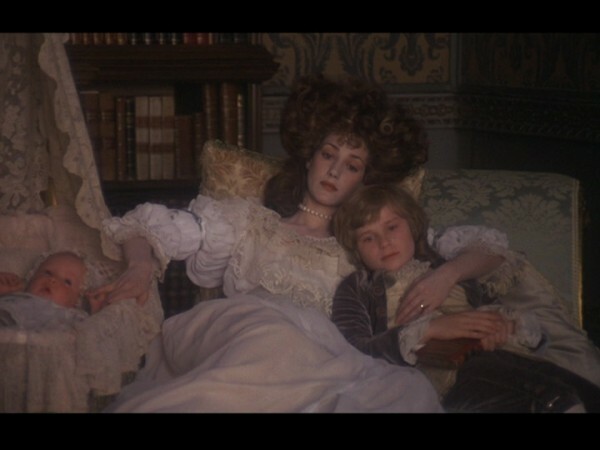 We get just a fleeting glimpse of a proper chemise gown in Barry Lyndon, only from the vantage point of Lady Honoria Lyndon (Marisa Berensen) reclining with her children. She wears another white gown which has a chemise-like appearance, but it isn’t a proper chemise owing to its lack of a gathered bodice. 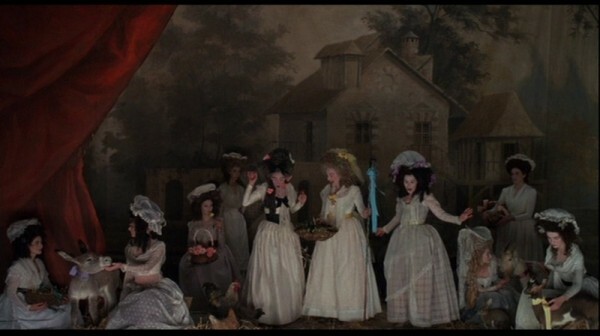 Costumes by Milena Canonero (of the 2006 Marie Antoinette fame). Annoyingly, these outfits aren’t seen in great detail on the screen. 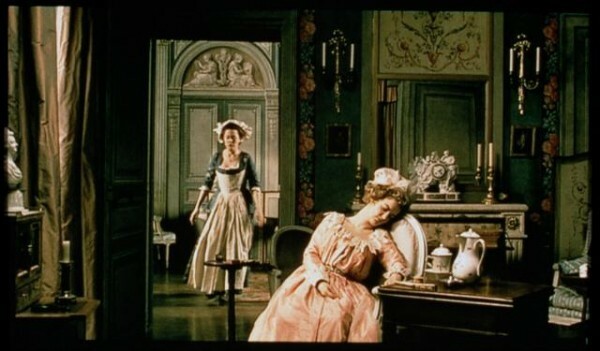 Marie Antoinette (Charlotte de Turckheim) and one of her ladies wear a spotted lawn and checked lawn version of the gown, respectively. The checked gown is particularly interesting for how sheer it is, showing the darker petticoat and stays underneath, as was frequently noted in contemporary accounts of the dress. 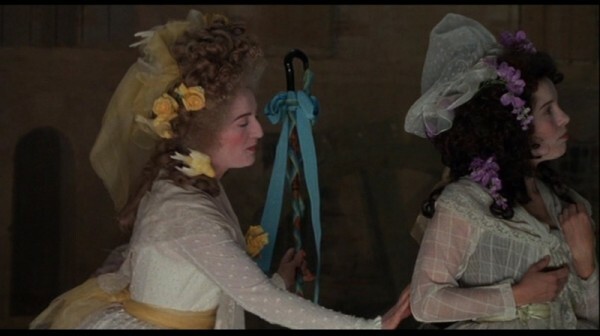 Costumes designed by Jenny Beavan and John Bright. 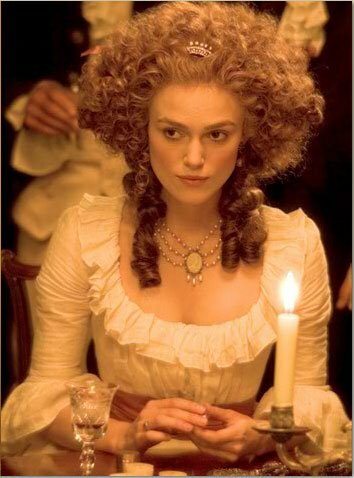 Lucy Russell plays the Scottish socialite Grace Elliot who is caught up in the French Revolution while living in Paris. 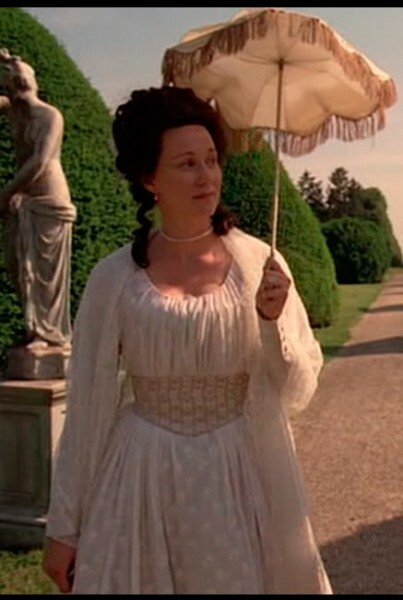 She is shown wearing at least two different chemise gowns, one of white muslin (worn with and without a blue sash in two different scenes) and one made from a pale pinkish fabric and worn as a sort of dressing gown. 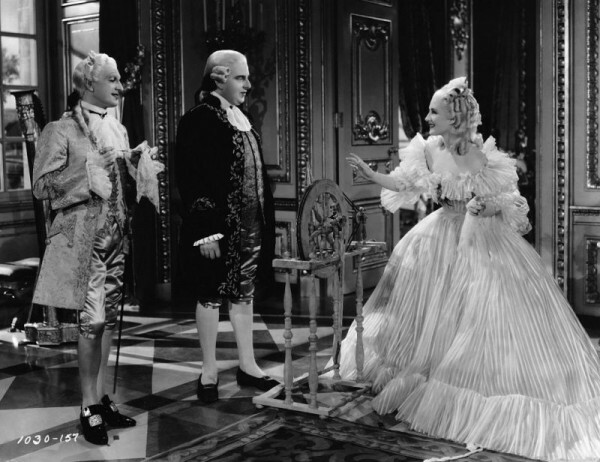 Costumes by Gilles Bodu-Lemoine, Pierre-Jean Larroque, and Maritza Reitzman. 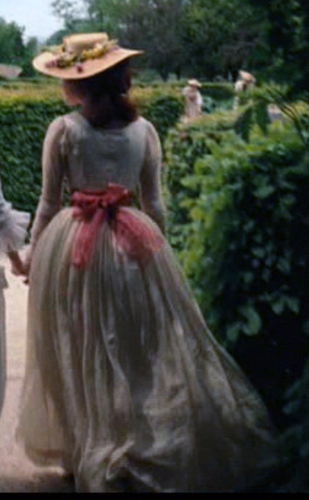 Abigail Adams (Laura Linney) and daughter Nabby (Sarah Polley) both wear chemise gowns in “John Adams”. 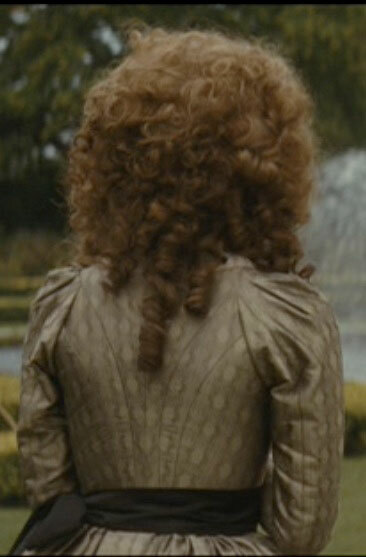 Abigail’s chemise is of spotted lawn, and Nabby’s is of a pale yellow lawn embroidered with a little leaf motif. Costumes by Donna Zakowska. 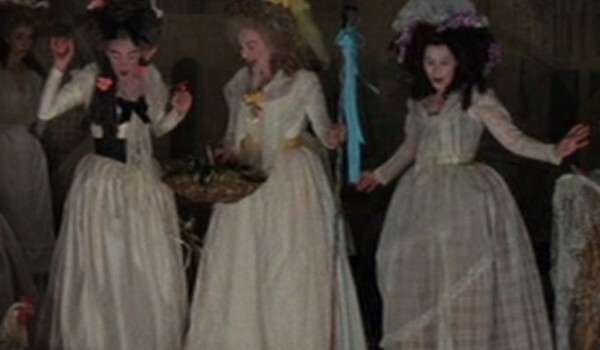 The costumes in The Duchess were designed by Michael O’Connor. 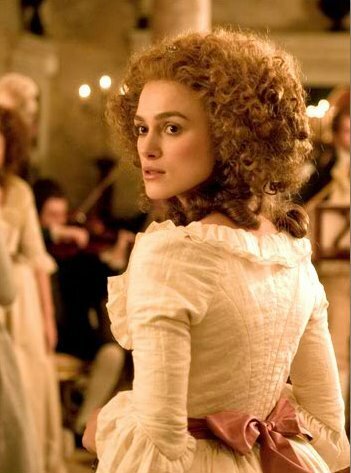 An interesting take on the gathered bodice of a chemise gown in Farewell My Queen. The construction seems more in keeping with 10-15 years after the Revolution, but I’ll let it pass, since it’s clearly going for the look. The costume design was by Christian Gasc and Valérie Ranchoux. Did I forget to include any chemise gowns on film? Post a link in the comments! THE CHICKENS ARE OUT. FABULOUS!! Tom Hardy? Did you SEE Leslie Howard? Totally my new boyfriend! But he’s such a wet noodle in GWTW!